The Main Library Learning Commons invites you to attend the faculty workshop Talk About Just Living: Classroom Strategies for Social Justice Learning in the Public Sphere on Friday, September 18th from 1:30-4:30pm. Take advantage of the second annual Theme Semester Just Living in Spring 2016 to infuse your assignments with social justice issues that will resonate with your students. Give students the opportunity to engage in dialogue about social justice in public using your curriculum as their voice. Faculty can use assignments and projects to encourage students to engage with social justice issues and to learn what it means to participate in a public conversation. Discover opportunities and resources available for showcasing student work connected to the spring 2016 theme semester Just Living. Learn how faculty and campus partners have promoted student work in public using the Learning Commons. Revamp a current or previous assignment into something that can be displayed or performed in public. Infuse social justice themes into a current or previous assignment. Learn how to use the Just Living website to market courses related to social justice. 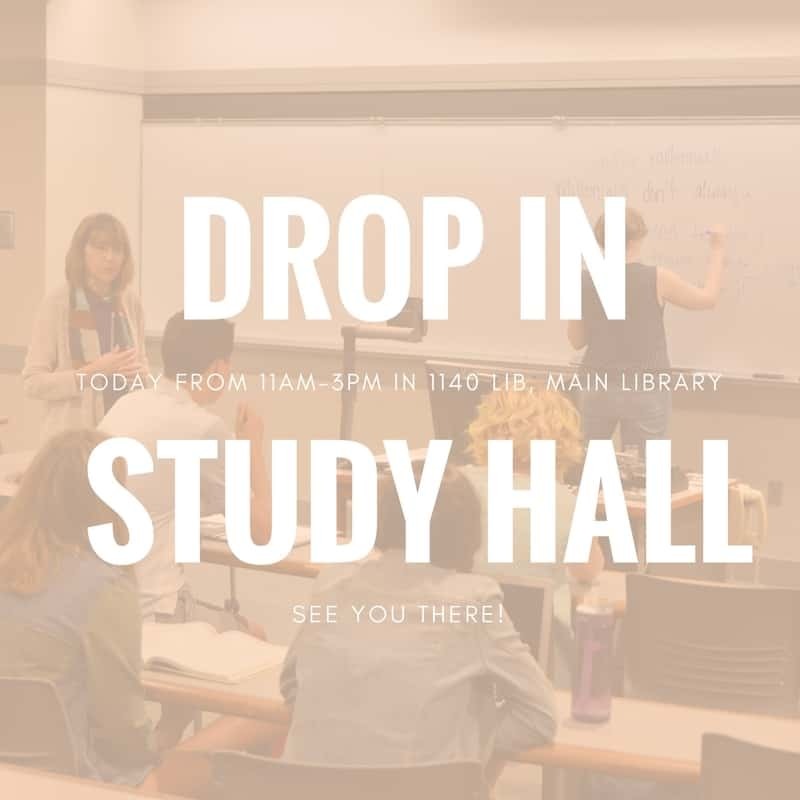 Experienced guest instructors will share their insights and experiences in using the Learning Commons to promote their students’ work and will demonstrate future opportunities on campus to showcase student work publicly. Participants will leave with a variety of project ideas for classroom use and will have the opportunity to return for an optional, drop in working session the following week where colleagues from the University Libraries, Learning Commons, and Office of Teaching, Learning, and Technology will be available for one-on-one consultation. The workshop will be held in Group Rooms 1103/1105 in the Main Library Learning Commons on Friday, September 18th from 1:30-4:30pm with an optional, drop-in work session on Friday, September 25 from 1:30-4:30pm. The institute is open to all faculty and instructors. There is no cost to attend, although pre-registration to the institute is required. Please register here. The University of Iowa Libraries invites faculty, staff, students, and the Iowa City community to celebrate the annual International Edible Book Festival April 1 by crafting a delicious book to share and, of course, eat. To participate, follow two simple rules: entries must be edible, and they must have something to do with books as shapes and/or content. Edible books will be displayed on April 1 in the Main Library Learning Commons, Group Study Rooms 1103 and 1105 in the South Lobby from 3:00-3:45 p.m., followed by a book tasting. Prizes will be awarded in multiple categories including Best Book Structure, Best Literary Allusion, Judge’s Favorite, Audience Favorite, and Best Tasting. Judges will include Executive Chef of the Iowa Memorial Union Barry Greenberg, and University of Iowa Libraries Special Collections Librarian Colleen Theisen. Photos and updates will be added to the Twitter hashtag #ediblebookiowa. 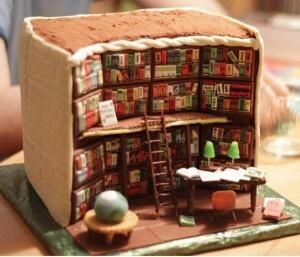 The International Edible Book Festival is an annual event held on April 1 around the world. The event unites bibliophiles, book artists, and food lovers to celebrate the ingestion of culture and its fulfilling nourishment. Participants create edible books that are exhibited, photographed, and then consumed. Information and inspiration can be found at www.Books2Eat.com. Individuals with disabilities are encouraged to attend all University of Iowa-sponsored events. If you are a person with a disability who requires a reasonable accommodation in order to participate in this program, please contact Brett Cloyd in advance. 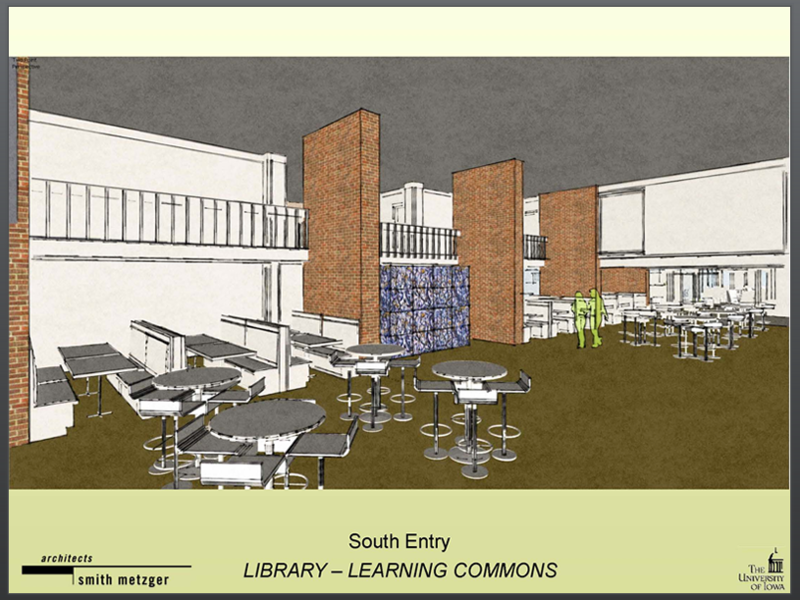 The Learning Commons project is a collaboration of the Provost’s Office, UI Libraries and ITS to create an intellectual hub for undergrads at the University of Iowa. When the new academic year begins Monday, Aug. 26, the University of Iowa will open the new Learning Commons in the Main Library, a tech-infused, 24-hour, comfortable study space and one-stop academic help center…with good coffee. The 37,000-square-foot space is the product of a partnership involving Information Technology Services (ITS), University Libraries, and the Office of the Provost. Incoming students participating in On Iowa! 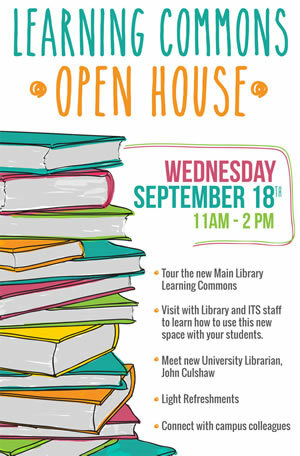 will have a preview of the new space on Sunday, Aug. 25, from 11 a.m. to 2 p.m., including the opportunity to meet tech and research geniuses, test their UI and library trivia knowledge, and take on new University Librarian John Culshaw in a Wii challenge. Features of the project include 18 group study spaces, 100 desktop and laptop computers, a 45-seat TILE (Transform, Interact, Learn, Engage) classroom with glass walls and sliding doors, printers and scanners, TVs and projectors, and multimedia resources. 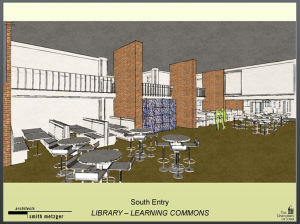 A consolidated service desk will be at the hub of the learning commons. Library and technical staff will be able to answer common academic questions and quickly facilitate expert-level assistance for academic and research issues. Collaboration technology and high-speed wireless connectivity will be available through the commons. 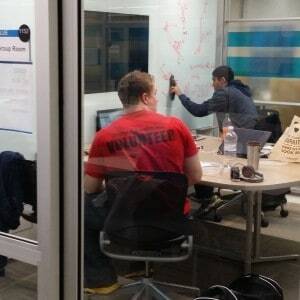 Commons staff will be at the ready to help with technology issues as well. The Food for Thought café will offer an expanded menu that includes made-to-order sandwiches, fruit smoothies, and other snacks, as well as espresso and gourmet coffees. 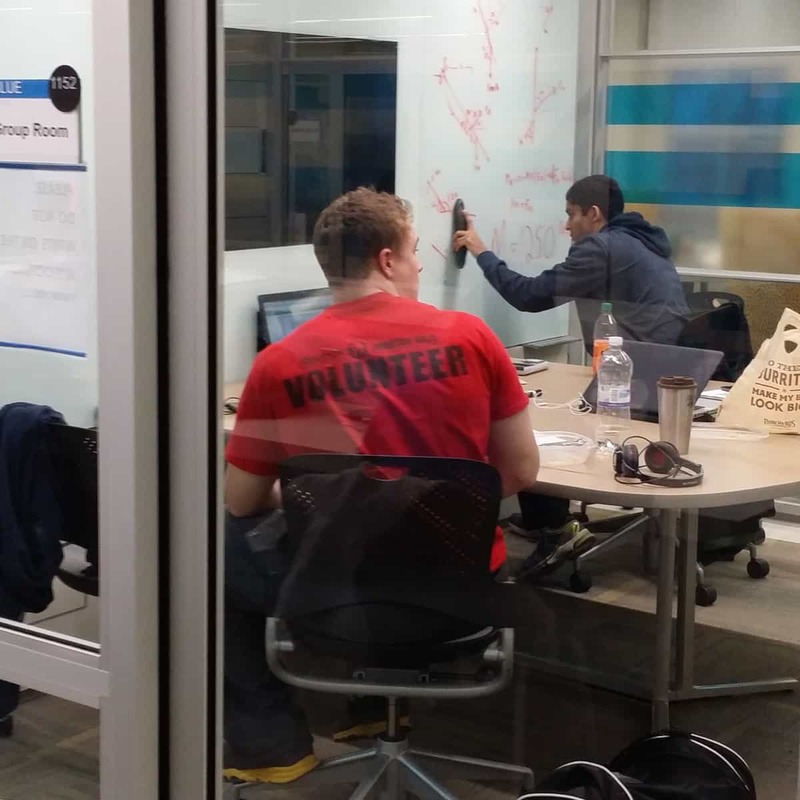 The space will be open all day and night with the exception of Friday and Saturday nights, in direct response to students’ ongoing requests for 24-hour study space on campus. 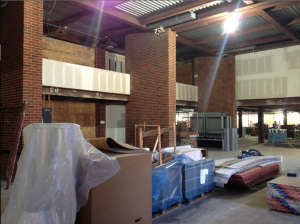 Construction on the new space included the addition of a new library entrance on Madison Street starting Aug. 26. This and the south entrance, which had been closed during construction, will both be open while the library’s north entrance will close to facilitate the next phase of library renovations. 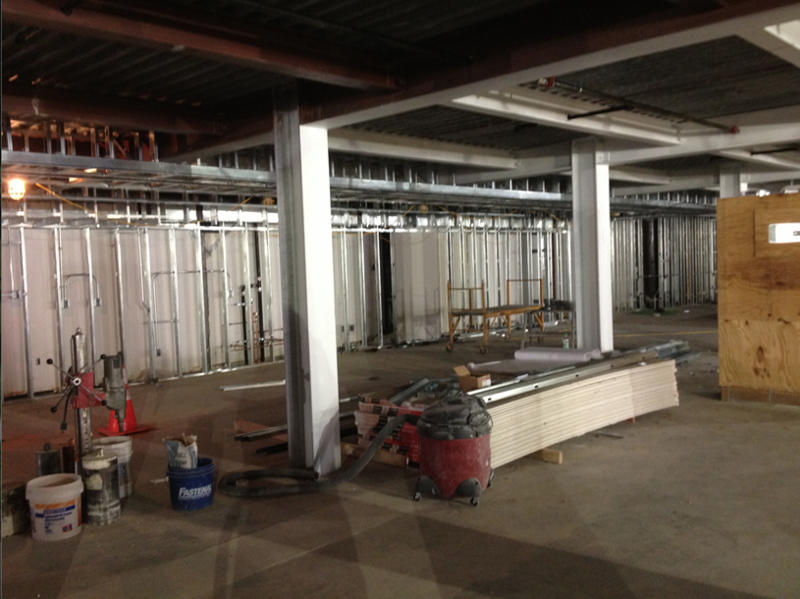 During phase 2 of the renovation, the north entrance will be transformed into a lobby space that leads directly into the Learning Commons. Within the next week work will begin constructing the new entrance to the library and learning commons on Madison Street. Because of this, Madison Street will be reduced to two lanes. At this time we are not sure how long Madison St. will be affected by this project. When the Learning Commons opens there will be three entrances to the building: North and South as well as the new entrance on Madison St. These days anyone who comes to the library will be greeted with signs of construction…noise, hard hats and plywood. What!?!?! !, might you ask, is going on in the library? We are in the middle of constructing a new space for student success, interaction and learning! 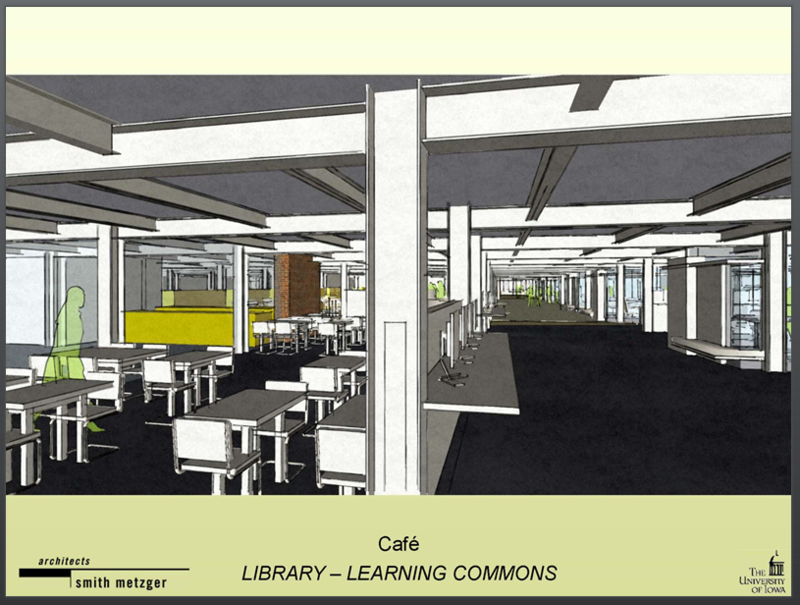 This fall the Main Library will be the home to the University of Iowa Learning Commons. 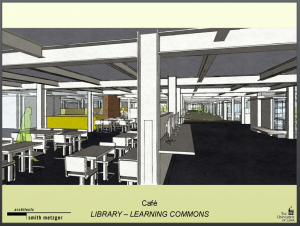 Brought to you through the collaboration and support of ITS, the University of Iowa Libraries and the Provost’s office, the Learning Commons will support student success by providing collaborative study and work spaces, cutting edge technology, good coffee, even better social interaction and great service! 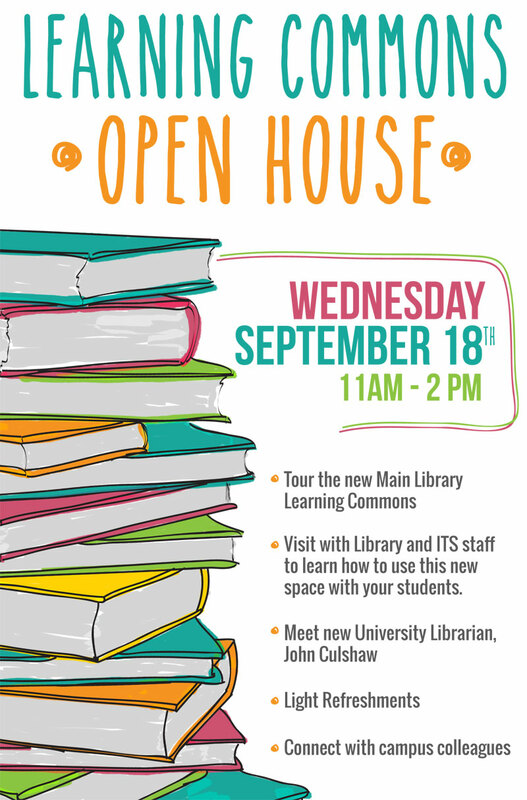 To be kept in the know visit the Learning Commons website and don’t forget to LIKE the Learning Commons facebook page! Our Facebook page is up and running and we’ll not only provide you with updates on the construction of the Learning Commons but we’ll post fun and interesting articles, reviews, and websites that support your educational, personal and professional interests! See you there! In the fall of 2013, University of Iowa students will discover a tech-infused, 24-hour, comfy study space and one-stop academic help center…with good coffee. Designed with significant student input, the new Learning Commons will provide an “intellectual hub” with room for 500-plus students. The 37,000-square-foot facility in the Main Library is the product of a unique partnership among Information Technology Services (ITS), University Libraries, and the Office of the Provost. The design team also considered students’ stomachs, because students can’t concentrate on their studies when they’re hungry. The Food for Thought café will offer an expanded menu that includes hot panini sandwiches, fruit smoothies, and other snacks, as well as espresso and gourmet coffees. 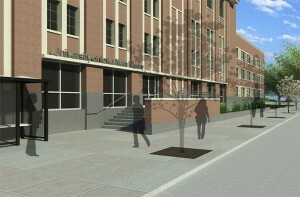 “We want to create an ambience that welcomes students,” Clark says. According to Beth Ingram, associate provost for undergraduate education, the most important feature of the space is its flexibility. Of course, part of the challenge in creating such a massive space for students is minimizing the impact the construction process will have on daily student life. Hope Barton, associate university librarian, says the impact on current study spaces will be minimal, since the area being remodeled was office space.